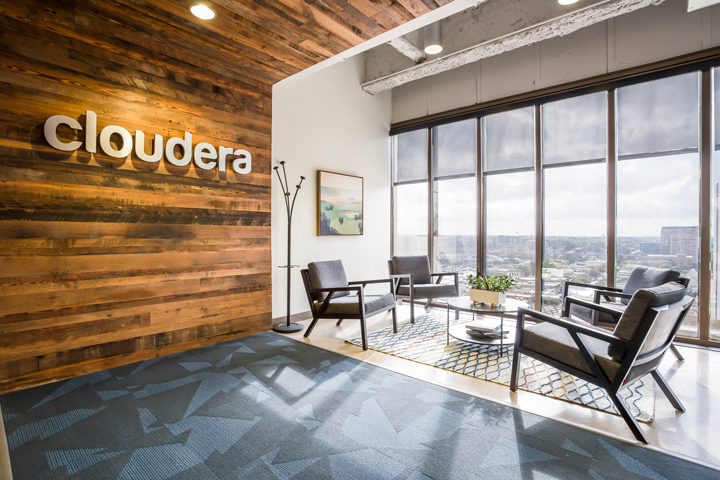 ARCO/Murray recently completed a 14,000 square-foot office expansion for Cloudera, Inc., a US-based software and data analytics company, in Austin, Texas. Cloudera previously occupied the entire 12th floor at 515 Congress Avenue and has now doubled their footprint with the expansion to the 13th floor. The space combines an open office concept with multiple conference and meeting rooms as well as modern private phone booths. It also features a new training room and break room, and an employee lounge area with floor-to-ceiling whiteboard paint walls to encourage project brainstorming and creative expression. Floor-to-ceiling glass with fogged privacy film was installed at all conference rooms, and a reclaimed wood feature wall and reception desk were incorporated into the space’s modern design.Custom wall graphics installed throughout include features and cultural aspects that highlight the vibrant city of Austin. This is ARCO/Murray’s third project with Cloudera. Previous projects include an upgrade to the company’s office in Chicago, IL and full office renovation in McLean, Virginia.